A New Jersey Trade Secret Registry Number (TSRN) is a code that chemical manufacturers in the state of New Jersey are required to list on their MSDS's or labels when they want to withhold the chemical identity of one or more components as a trade secret. Some sheets use the acronym NJTS or TSR in place of TSRN. TSRN's may apply to ingredients or products that are hazardous or non-hazardous but should not be used for substances that are carcinogens, mutagens or teratogens. By using its own alpha and/or numeric numbering system. If this option is chosen, the trade secret registry number shall be preceded by the words "New Jersey Trade Secret Registry Number." The acronyms and symbols "NJ," "TSRN," "TSR," "No.," and "#" may be used. Note: In New Jersey EIN's are the same as the company's IRS-assigned employer identification number, EIN. There are detailed procedures that a manufacturer must follow in order to claim and register a trade secret in New Jersey. See the link to the New Jersey Administrative Code under Further Reading for further explanation. Good safety practices are no secret. 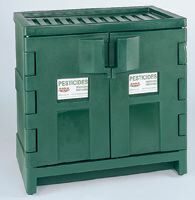 Get your pesticide cabinets, flammable storage cabinets and more at Safety Emporium. TSRNs will appear on an MSDS whenever a New Jersey manufacturer wishes to withhold the chemical identity of a product or its components by claiming a trade secret. Few materials meet the requirement for trade secret, so this term appears on only a relatively small number of MSDS's. The New Jersey Worker And Community Right To Know Act Major Provisions Of Right To Know Labeling For Private Sector Employers (April 2000) at the NJ Division of Epidemiology, Environmental & Occupational Health. The New Jersey Administrative Code 8:59 at the NJ Division of Epidemiology, Environmental & Occupational Health. The State of New Jersey Department of Health and Senior Services deals with occupational health in the state. See also: CAS Number, EINECS, trade secret, UN Number.